The park system presently has four trails for hikers, bikers, bladders, and boarders. The trail way offers our citizens a safe and enjoyable experience as they hike and bike throughout Rodeo Park's natural environment. Walkers and bicyclists can enter the trail at any point in Rodeo Park. The main portion of the trail was covered with an asphalt overlay in 2006 and widened to allow for handicapped accessibility. The trail is closed to motorized vehicles and horses. 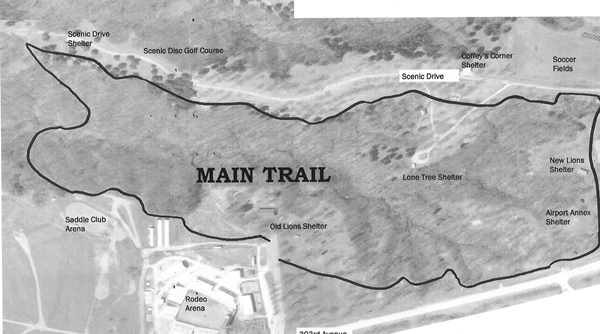 The Scenic Drive extension off of the Main Trail is a gravel trail that follows the Scenic Drive Disc Golf Course that winds back into the depths of Rodeo Park. This is a winding concrete trail located within Ivanhoe Park is available for in-line skaters and skateboarders. Small ramps and rails are located alongside the trail for beginners and novices alike. For more skillful boarders and bladers, a skate park located within Ivanhoe Park is also available. This is a concrete sidewalk running from 48th Street to Crescent Lane allows walkers and bicyclists a safe and scenic view of the bluffs. This is a paved walking trail that runs from Prum Strass (6th Street) west along the riverfront past the re-creation of Old Fort Madison and the beauty of the Kuhlmeier Reflecting Pond at Riverview Park. The first two phases of a project to promote a healthy lifestyle is now open in Lee County. Officials cut the ribbon December 3, 2017 on the second phase of the trail. 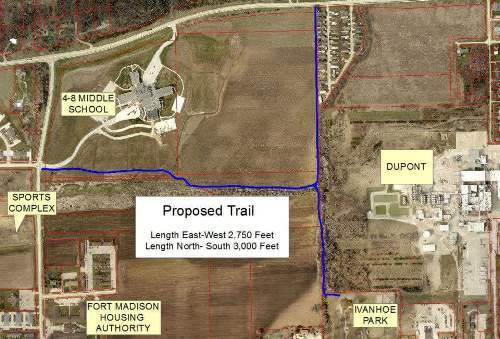 First phase runs from Ivanhoe Park to Bluff Road and the second phase runs from the trail to Baxter's Sports Complex on 48th Street in Fort Madison. It's the first of three projects that a local organization wants to complete. The organization, Promoting Outdoor Recreational Trails, or PORT, has a goal of enhancing the living experience in the area to keep people active. The project started in November and organizers say the goal is to try and connect all the parks and trails in the city. "It's so exciting to see that we are putting something permanent in Fort Madison that will encourage people to be healthier and be outside more which is exciting and encouraging for everyone," Committee Chair, PORT of Fort Madison, Rachel Benda said. Phase 3 is now in the planning stage. It will run from Baxter's Sports Complex on 48th Street to Fort Madison Community Hospital.